Just imagine adorable children running around you, excited women talking about beautiful and powerful men, an old man who decides the destiny of tennis players. Did you feel it? It’s all about the beginnings of Cornilleau Table TennisTables! Everything started in a workshop in France, in 1946, when Emile Cornilleau opened his own business. How much time do you think it took him to become a legend? How did he to produce table tennis tables? How did he change the world? Let’s take them one by one. It took Emile 23 years to start the production of table tennistables. He always strived to improve his company. 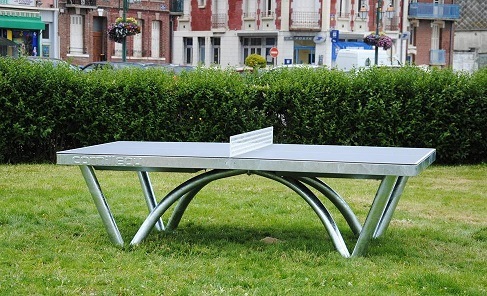 He paid attention to safety, quality of play and design, and he did it in such a way that he managed to create unique and unrepeatable table tennis tables. The company has been developing since 1969. Cornilleau had been manufacturing tables for 40 years in 2010, when they were already exporting to 65 countries all over the world and they were for sure the European leader of the ping market. Emile assumed the responsibility of entrusting his company to his son, who vouched to should ensure the continuity of the Cornilleau Table Tennis. Table tennis tables instead of furniture? Tennis was unpopular, and nobody thought it would change one day. In 1946, Cornilleau’s relatives were sure he would manufacture furniture. And so he did, for about 2 decades. It is still a mystery how Cornilleau decided to manufacture table tennis tables, but the legend says he was a really big ping-pong fan. He used to create new technologies for his company. He created a new generation of outdoor table tennis tables. A few years later, he industrialized his company to obtain better quality. From that moment on, he has never stopped improving tables. This short story of an amazing man who created the greatest production-line of table tennis tables has neither a good ending nor a bad one. It is an unfinished story, with hundreds of pages more to be written. Now, when Cornilleau Tables Tennis Tables are the best known around the world, their producer can be sure that he did a good job for us all, professional players and amateurs alike. Is tennis racquet grip important while escaping elbow injury?